I attended Macy's Culinary Council's cooking demo with Chef Stephanie Izard, of Girl & The Goat, at the historic Macy's on State Street. The room was packed with people eager to learn how to make game day bites for Superbowl Sunday, any game day or Sunday supper! Stephanie kicked off the event with a masa chip demo, and dips like pimento cheese and cheesy crab. It was clear Stephanie's winning move was the sloppy goats. She also gave a detailed play by play on how to recreate restaurant quality dishes right in your own kitchen. A quick peak at her playbook reveals how to pickle vegetables and make a rosemary aioli and pimento cheese dip among others. She also educated all her guests about goat meat as she is all about that goat, that goat. I am excited to share her recipe with you as it is on the menu at her restaurant Little Goat Diner. In a large pot heat 2 tablespoons of vegetable oil over medium-low heat. Add onions and cook them until soft and translucent, taken care not to brown them, about 10 minutes. Add garlic and tomato paste and cook for two minutes. Add the tamarind, yellow mustard, dark brown sugar, malt vinegar, soy sauce, tomatoes, miso and hot sauce and simmer for 60 minutes. In batches, transfer mixture to a blender and process until very smooth. Working in batches, brown the goat meat in a large skillet. Transfer goat meat to a pot and cover with the sauce. Heat over medium low heat and keep warm. Mix the cabbage and aioli in a bowl and season with salt. Toast the buns. 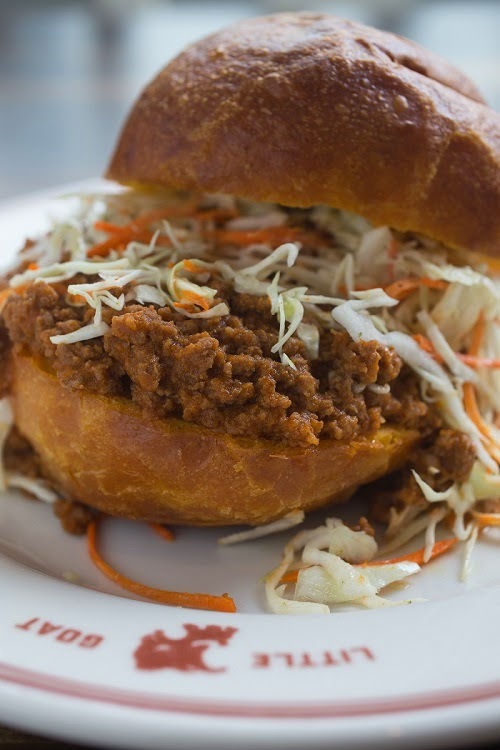 Scoop 8oz of sloppy goat into the bottom buns. Top with a handful of the rosemary cabbage slaw and cover with the top bun. In a bowl add the egg yolk, dijon, sherry vinegar, soy, sambal and honey. Begin mixing ingredients with a whisk, while still whisking slowly add the oil. Continue to slowly add oil and whisking to emulsify. Add the rosemary and season with salt.